Director – Jerrold Freedman, Teleplay – Christopher Knopf, Producer – Paul Junger Witt, Photography – Leonard J. South, Electronic Music – Gil Melle, Makeup – Frank Westmore, Art Direction – Rolland M. Brooks. Production Company – ABC Circle Films/Spelling-Goldberg Productions. Doctors Robert Jones and Frank Enari are flown in to the Tower Mountain Research Station, a high-altitude mountainside laboratory where scientists have been conducting experiments on apes for the Space Program. One of the scientists Vogel is found sitting at the radio with the window left open where the sub-zero temperatures have frozen him to death. As they continue the experiments with the apes, Jones puzzles over aspects of Vogel’s death that do not add up. The two of them are plagued by mysterious things happening, including the generator being found switched off at night and the window left open. 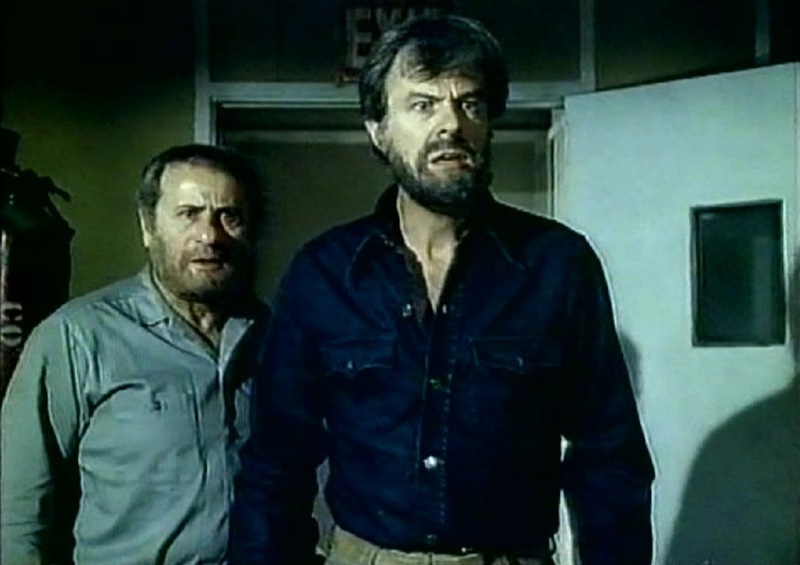 Cabin fever mounts as Enari accuses Jones of going to pieces mentally and sabotaging the equipment, while Jones remains adamant that the explanation lies elsewhere. A Cold Night’s Death is a classic tv movie that came out of the great 1970s era of genre tv movies. The period also produced classic science-fiction ventures such as The Love War (1970), Night Slaves (1970), The Questor Tapes (1974) and Where Have All the People Gone? (1974). Steven Spielberg made Duel (1971), while other works like The Night Stalker (1972), The Night Strangler (1973), Frankenstein: The True Story (1974), Trilogy of Terror (1975) and Salem’s Lot (1979) did more sophisticated things with horror material than most theatrically-released films of the era.. I had heard about A Cold Night’s Death for many years before getting to see it. It had not been in wide circulation since its initial airing but has become available on YouTube in the last few years. The advance word had pumped its reputation up as a superbly eerie and tense thriller. The scenario of the scientists isolated in a high-altitude mountain laboratory as something lurks cannot help but create association with The Thing from Another World (1951). Indeed, you cannot help but speculate that the image of the scientist found frozen to death at the radio desk served as inspiration for one of the iconic images in John Carpenter’s subsequent remake The Thing (1982). A Cold Night’s Death quite remarkably manages to strip the complement of the base down to only two men – there is a third man present at the outset but he is just the helicopter pilot and departs fairly soon in and the entire show plays out between the two scientists. Moreover, the nature of what is happening is never made clear until the very last scene. What we have is a paranoia and cabin fever drama that works rather effectively. The one thing that all of the other commentary about the film that I had read before seeing it tended to highlight was the twist ending. On the site here, for example, I would be scrupulous about not giving this away and make a point of always prefixing the discussion of endings with a spoiler alerts warning in bold (as you see below). It would seem that other genre commentators, particularly in the print media, have not been so scrupulous about such. I would describe the film along the lines of “scientists at a remote research station succumb to cabin fever and paranoia as they find something is toying with them” whereas other commentators have always described the film in terms of its twist ending [PLOT SPOILERS] “scientists at a remote research station discover that the apes they are experimenting on have been experimenting with them all along,” which leads you to expect a film more along the lines of something like Link (1986). [PLOT SPOILERS CONTINUE] The whole film is a build-up to this twist revelation. In this respect, A Cold Night’s Death resembles more a half-hour episode of a show like The Twilight Zone (1959-63) or even more so The Outer Limits (1963-5) than it does a full film. The crucial thing about the twist, especially in comparison to the way it has been revealed as a crucial plot element by other commentators, is that it only becomes apparent in the last shot of the final scene. Indeed, the rest of the film is a deliberately Lewtonian one that has something happening in the laboratory but it being unclear what. We never see a single ape until this last frame, leaving the nature of the menace as an unseen one right throughout. In delivering the twist this way, the film deftly avoids any explanation for the cause of the sudden rise in ape intelligence. Jerrold Freedman had mostly directed in television, including making episodes of shows such as Night Gallery (1969-73) and The X Files (1993-2002, 2016-8). Screenwriter Christopher Knopf had a four-decade career in film and television, including writing the classic alien monster movie 20 Million Miles to Earth (1957) and the adaptation of The Choirboys (1977). One of the surprises about the film is that it is co-produced by Aaron Spelling, best known as the man behind Fantasy Island (1976-84), The Love Boat (1977-86), Charlie’s Angels (1976-81), Beverly Hills 90210 (1990-2000) and a mountain of other shows. For a time in the early 1970s, Spelling made a career out of these horror tv movies with the likes of Crowhaven Farm (1970), How Awful About Allen (1970), The House That Would Not Die (1970), A Taste of Evil (1971), Satan’s School for Girls (1973) and Cruise Into Terror (1978), as well as the sf film The Love War.